The relentless polar vortex has made my first New York winter shockingly chilling. So, I have retreated into full hibernation and spend my free days cooking, feasting and finding excuses not to leave my sanctuary. My go-to winter dish is my Turkey Bean Chili or as one friend hailed it, “the best chili I’ve ever had.” I’m not normally boastful but this dish seems to please the most demanding chili-freaks. And now they seem to expect it on wintry days. So while the crowd is out sledding in the park, I’m turning out a big potful. 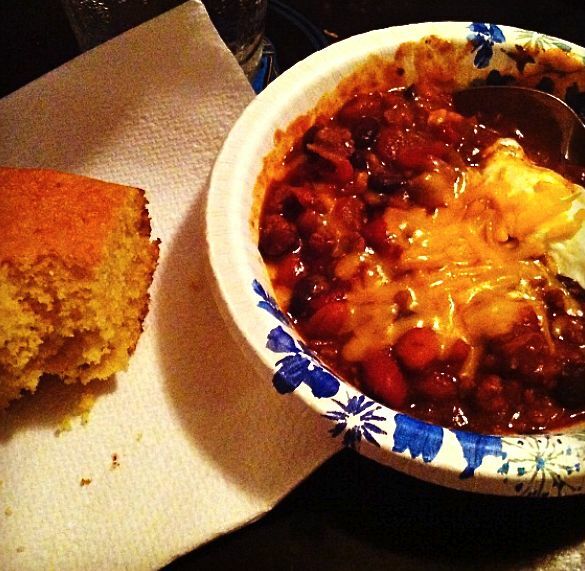 I warm my insides with a hot bowl of chili and a fresh slice of buttermilk cornbread. They arrive with bottles of wine and dessert, knowing I’m willing to share. ½ pound kidney beans, ½ pound pinto beans, ½ pound black beans, cooked together till al dente. 1. To cook the beans beforehand, soak for at least an hour then boil for about an hour to an hour and a half, or until tender. Reserve the leftover water for the chili. 2. In a large soup pot, brown turkey over medium heat, stirring often. Drain excess grease. Add in the onion and cook until tender. 3. Chop the tomatoes, add to pot, with one cup of liquid. 4. Add the beans, along with the jalapeños, garlic, chili powder, cumin, cayenne pepper, paprika and salt; mixing thoroughly. 5. Pour in second cup of broth/tomato juice, then bring chili to a simmer. 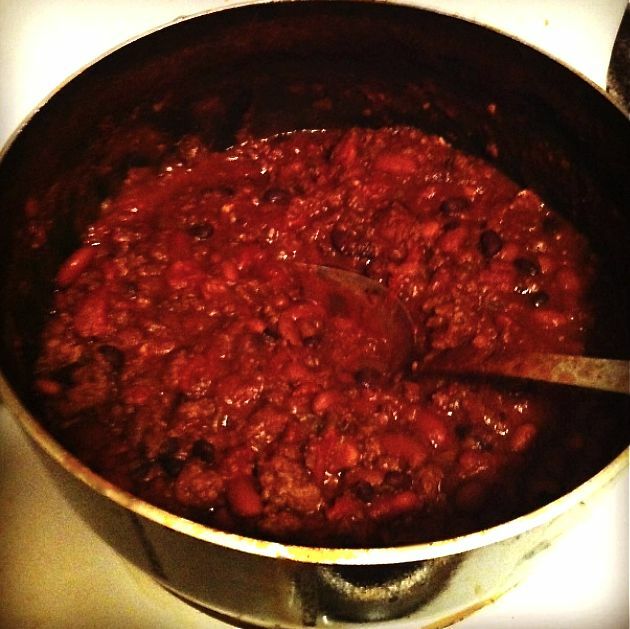 Allow chili to reduce until thick, about 30 to 45 minutes, stirring regularly. If you prefer a soupier chili, add up to one additional cup of broth. 6. Serve in bowls and top with a dollop of sour cream and a sprinkle of cheese. 7. Note: You may substitute canned beans and canned stewed tomatoes but watch for too much salt.